Remember last week when I mentioned the election and how it is your civic duty to vote? Well that still stands. Get out the taco vote! today is the day! make history! You are so lazy. You are still reading. Why don't you vote? You have a chance to change your government. According to Zuma Dogg at Mayor Sam's Sister City blog our candidate Juan "Johnny Jay" Jimenez is on the rise. Was it the power of the taco community or just a coincidence? I say never underestimate the power of the taco. So I went back to the taco mecca to get the pulse of the electorate. 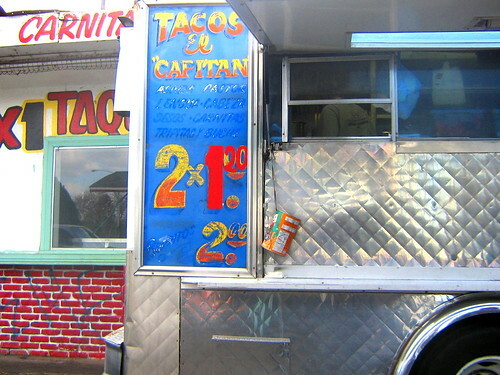 My first stop was El Capitan a taco truck that parks on the lot of the El Capitan Taqueria. The actual taqueria looked to be closed or was possibly just used for storage. Or who knows maybe there were some shady poker games going on inside. The tacos were 2 for $1 and burritos were only $2 . 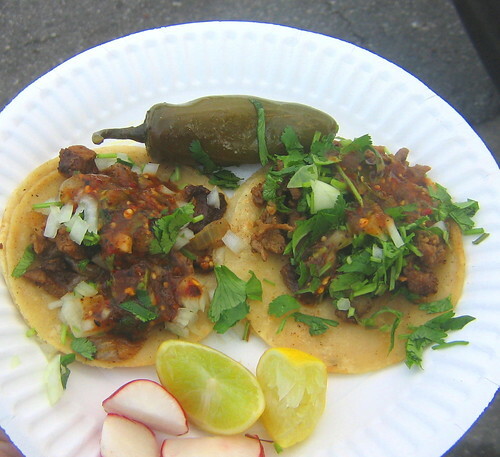 These little beauties came on two small corn tortillas with finely chopped lean meats and a smokey chile salsa . They were excellent and at 50c each the best deal in the city. For $2.75 you get a plate of 4 tacos and a can of soda. 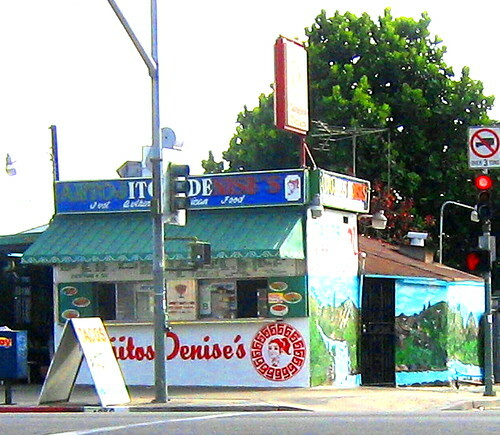 Just east of El Capitan is the famed Antojitos Denise's taco stand. 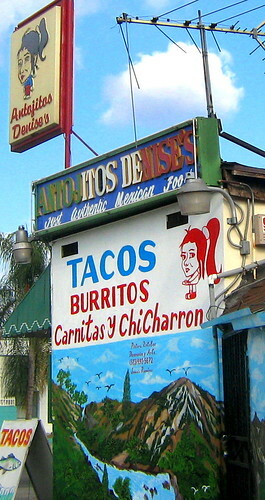 After four tacos at El Capitan I only had room for a couple more so I went with what Antojitos Denise is known for, the pork. The carnitas was outstanding but the al pastor crumbly and disappointing and nowhere near as good as the al pastor from the now closed Antojitos Denise in East Hollywood. 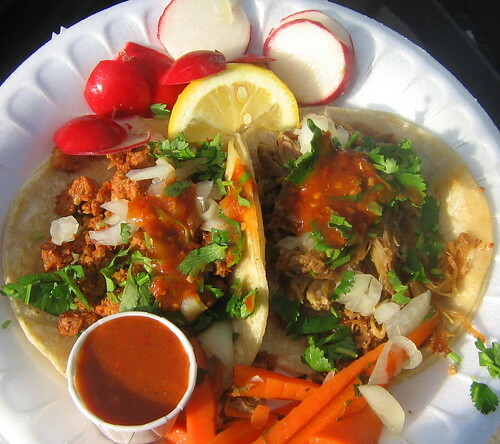 The secret with the carnitas is that they fry it in seasoned pork fat. Mmm seasoned pork fat. The salsa roja was spicy and full of flavor. I poured the remaining salsa on top of the crumbly al pastor to hide the pork's deficiencies, a trick I use when I come across a poor taco but have an excellent salsa. The city was thriving but you wouldn't know that we were on the eve of a city election. The few people I talked to didn't know anything about the election. And I guess that's the problem with city politics. Do the people not show up at the polls because they are dissatisfied with the process or because they are unaware of the election? Probably a little of both. Well I'm off to vote and then going out for tacos. I tried El Capitan with a couple buddies on 09/17/07. The tacos come out small which is expected but they come packing loads of flavor. The asada was a little charred and had nice flavor. The salsa was not too spicy but it had great taste. Warning....stay away from the tripas. Definitely worth the drive to find this truck because of the awesome value.